Our final day started as did all the other days of the Tour, with a 5am breakfast! 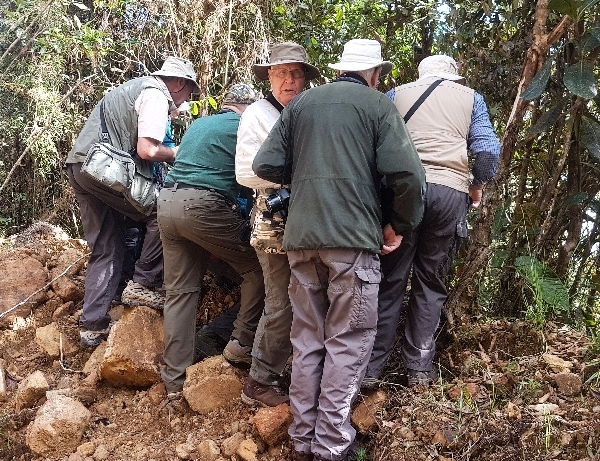 Our sojourn in Colombia was over and now we faced the unenviable task of the making the journey home. We left at 5:30am and my particular journey would not end until 8:30pm the following day!! Nevertheless, I was looking forward to some birding stops along the way to the airport at Medellin this morning. The Tody Motmot is down there somewhere! We made two stops along the way at places we had stopped before to look for the Tody Motmot, this mythical bird did not materialise today either. If such a bird exists? We did hear it calling from deep in the roadside forest. A consolation prize was our first Orange-billed Sparrow sighting and several other species put in an appearance. A Black-and-White Warbler showed well as did a Roadside Hawk, Yellow-tufted Dacnis and a few common Tanagers. The next stop was a lot more productive, the trees were alive with birds and bird-song, The Yellow-browed Shrike-Vireo called monotonously whilst shrills, and trills came from everywhere. We quickly located our first Red-rumped Woodpecker of the trip and another first, a party of Collared Aracaris. A Black-bellied Wren was also a first for the trip we all got good views of a pair of them. The Tody Motmot never showed up to say adios to us but plenty of other species kept us entertained for an hour or so. My bunch of 'Spanners' (Wing- spanners that is! ): from Left to Right: Johnnier our guide, Mike Ambler, Me, Reg Cox, Dave & Vanda Owen, Helen Stedman, Paul Edlin, Jeff Bailey and Ray (boggy) Marsh. We took a most-welcomed brunch at a Ranchero Grande on the main road a few kiometers outside of Medllin, again the area was full of birds, herons, egrets, ibis, vultures and flycatchers to name but a few. Our internal flight was due out at 15:25, we made it to the airport in good time and boarded our flight on schedule. At Bogota we had rather a long wait for the our international flight back home to London, it departed 40 minutes late at 23:30. During the wait some of the group took a walk along the busy appraoch road to Bogota Airport. 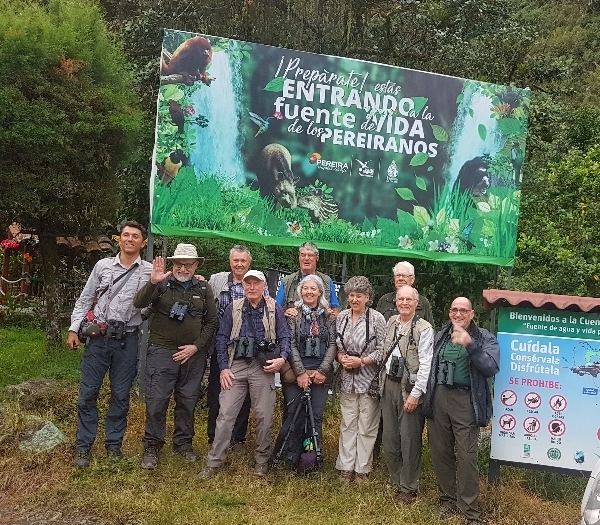 We found a few species, Lesser Goldfinches, Yellow-bellied Seedeaters and the four most commoin species in Colombia: Great Thrush, Eared Dove, Rufous-collared Sparrow and Ruddy Ground Dove. We touched down in London on time at 14:15 the next day after a nice flight. The tour was over, we all said farewell at baggage reclaim and went our separate ways. Our final count of species was 423 plus a dozen or so that we heard but did not see.